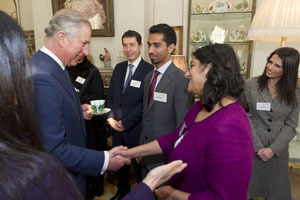 MOSAIC : a charity that creates opportunities for young people of all backgrounds growing up in our most deprived communities – was invited to tea at Clarence House. It’s amazing inside, it’s just like an everyday family sitting room with ornaments and family photographs on the furniture – except that the family is the Windsors and the ornaments are worth more than a semi detached in East London. 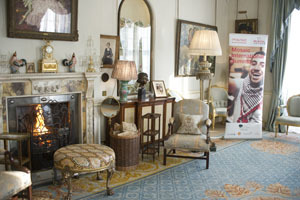 Here the first picture shows the room before everyone is assembled for tea and biscuits. I like to have the shutter in quiet mode when no one else is taking pictures but I’m not very impressed with it – it’s just not very quiet. The clatter of the reflex mirror is just spilt into two clatters. Nikon says: ‘the mirror is raised and the shutter is released but the mirror is not lowered until the shutter-release button is released. Thus the photographer can choose when the camera releases the mirror‘ …erm, that’ll be right away since I can’t see anything while the mirror is left up and I need to take another picture, please. I was asked recently ‘Can’t you just choose to turn that noise off these days?’ Damn those Smart phones and their sound effects!